Squeenix CEO Yoichi Wada thinks that in ten years' time we may not have consoles as we know them - but you know what? He's okay with that. There's a widespread cultural perception amongst we Westerners that Japanese businessmen are cut from an entirely different cloth - that they are very reserved, that they are not as forthcoming and open with their actual beliefs for fear of losing face, and that sort of thing. 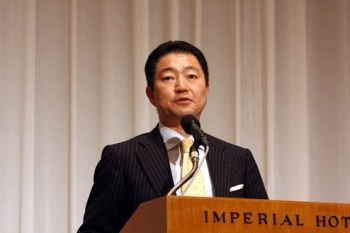 For the most part, it may be true, but you wouldn't know it by looking at Square-Enix CEO Yoichi Wada. Wada hasn't been afraid to say some controversial things lately, which is odd given his position as the head and public face of one of the largest game developers and publishers in the world. Lately, he's called his countrymen out on a perceived bias against Western games, he's said that his company will be delaying releases in Japan to create more worldwide parity with launch dates, and he's exhorted his fellow Japanese developers to make more games for adults. Now, Wada has gone on the record envisioning a not-too-distant future in which consoles don't exist, but it isn't a future he minds. "It's tough to say at this moment. But let's say in ten years time what we traditionally call 'console games' simply won't exist. The exact timing at which it will go away is hard to determine, but somewhere around 2005 the console manufacturers' strategy shifted. In the past the platform was hardware, but that switched to the network. So a time will come when the hardware isn't even needed any more. Because the true strength of the Xbox 360 is Xbox Live." Though the Squeenix big cheese says that the elimination of traditional consoles would of course have a major negative impact on the major distribution and sales firms, it's one that the platform owners themselves are preparing for. Microsoft is integrating its Xbox Live and Games for Windows Live platforms to consolidate their strengths, he said, whereas Sony was, with its Cell-powered PS3, moving toward something "like a home server in a sense." As long as Wada and Square-Enix are able to sell their games on these new platforms, he probably won't have a problem with it. But will players?